DairyNZ has kicked off a potentially game-changing research project to test the benefits of plantain in local pastures. At the moment, a significant proportion of dairy farms are operating without consent for intensive farming activities. Farmers are faced with reducing nitrogen leaching by an average of 60 percent to meet targets outlined in the Horizons Regional Council One Plan. It’s a massive challenge, but in a new approach, DairyNZ scientists are working with unconsented farmers in the catchment to help them reduce their farm’s environmental footprint. 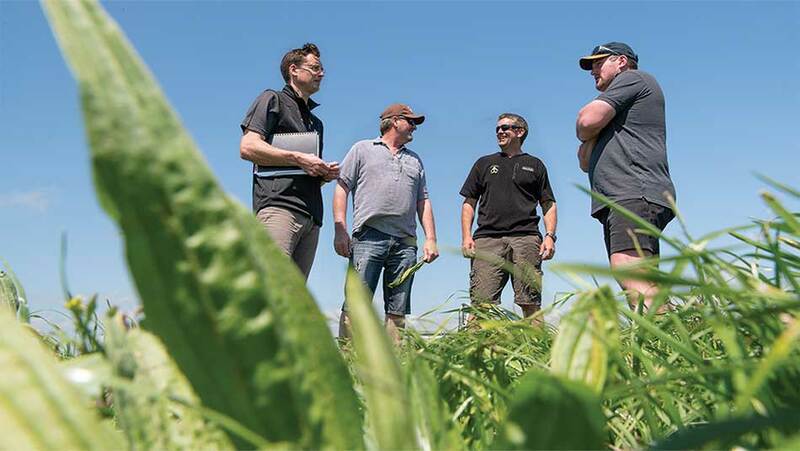 DairyNZ catchment engagement leader Adam Duker, working with Horizons Regional Council, Massey University, agronomists, and a six-strong project team, has developed the Tararua Plantain Project – a seven-year plan to test the benefits of plantain on 125 dairy farms in the area. The project began in the 2018-19 season and will run for seven years. The Tararua Plantain Project capitalizes on research findings from the DairyNZ Forages for Reduced Nitrate Leaching (FRNL) programme which established that New Zealand bred plantain cultivars reduce soil N concentration under cows’ urine patches. This allows plants to take up a greater proportion of N, reducing N leaching (estimated to be between 5 and 30 percent, depending on soil type and the proportion of plantain in the cows’ diet). Testing the benefits of plantain in local pastures is at the heart of the project. Simultaneous research locally and on research farms recognizes the size and the urgency of the task ahead. Paddock-scale research has begun on six local farms and the findings will be shared with other farmers in the area. Professor Peter Kemp, Soledad Navarrete and David Horne from the School of Agriculture and Environment are carrying out research at a university farm, measuring N leaching from plantain pastures compared with ryegrass pastures. They’re supporting farmers by sharing the results of this research. In turn, Tararua farmers are contributing to the Massey research by evaluating ways to best integrate plantain into their farm systems. Dr Nic Peet, Horizons strategy and regulation manager, says the project’s success will help drive water quality improvement in the Manawatu River and help farms meet regulatory requirements to reduce N.
Tararua dairy farmers Blair Castles, Mark Diamond and Brad McNaughton are already using plantain in their pastures. As System 2 and System 3 farmers and members of the project’s monitoring group, they’re keen for others to learn from their results. Dannevirke dairy farmer Blair Castles is a farmer on a mission. He says when he found out DairyNZ was suggesting using plantain to reduce nitrogen (N) leaching, he was keen to get on board. He’s just one of several farmers in the area who are tackling the issue head-on – and sharing their findings with other farmers, thanks to DairyNZ’s newly established Tararua Plantain Project. Blair has been using plantain, along with chicory, for about six years. He’s looking at taking out chicory and lifting the rate of plantain. At present, chicory is 10 percent of his sward; plantain’s about the same. Blair plants plantain in autumn, after the summer turnip crop has been lifted. He has a 15 percent regrassing programme underway, so it’s early days in terms of results with plantain. He plants kale in winter and will also add fodder beet to the mix this year. Blair tries to keep his use of urea low: about four tonnes per year on the 100ha milking platform. He says this seems to be an effective ratio, so it’s not necessary to pump more on. Blair's neighbour Brad McNaughton has already done a few farm trials of his own and is including chicory and plantain in his pastures. About four years ago he started using ‘Rocket Fuel’ – a mix of plantain and chicory with white and red clovers. Brad says the monitoring group meets every three months, or before drilling, to gauge what everyone’s doing and share information about the trial. Mark has been using plantain for three years. In a 10ha trial, he’s using about 2kg plantain/ha as part of a mixed sward with ryegrass and clover, which he sows after the summer turnip crop has been lifted. Mark says farmers know they must make changes but, because every property is different, there’s no ‘one size fits all’ solution. Mark is also trying a few other things, like using gibberellic acid and liquid urea, to strategically-reduce N losses and increase pasture growth at times when growth rates are typically low. Led by DairyNZ, the Tararua Plantain Project is helping unconsented farmers keep on top of nitrogen leaching. (Left to right: DairyNZ catchment engagement leader Adam Duker and local dairy farmers Mark Diamond, Blair Castles and Brad McNaughton).